Bitcoin is the first and most popular decentralized digital currency that can be bought, sold, or traded as a commodity. It is widely accepted as a payment method worldwide. There are several ways to acquire bitcoin. Primarily, the digital currency can be bought from a wide range of cryptocurrency exchanges. Bitcoin can also be bought directly from people in the community. The Local Bitcoins will provide a guide to various sellers of bitcoin in one’s area. Bitcoins can also be bought using an ATM. The Bitcoin ATM Radar will help find the closest machine that offers this service. To buy bitcoin, it’s first necessary to download and install a wallet. There is a wide choice of free bitcoin wallets for all major operating systems and devices. The full list of desktop, web, mobile and hardware wallets is available here. The wallets must be well-protected in order to avoid any security breaches. It is highly recommended to keep only small amounts of bitcoin in the computer, mobile or server for everyday use and keep the rest in a safer place. To protect the wallet against computer failures, it is recommended to backup the wallet on a regular basis and keep the backup in a safe place so as to recover the wallet should anything happen to the computer or mobile phone. Users should make sure they use a strong password and never forget it, as bitcoin provides very limited options for password recovery. Hardware wallets are the best way to keep one’s cryptocurrency. These little devices are designed to be a wallet and nothing else so that no software can be installed to them. This makes the devices secure against computer vulnerabilities and online thieves. The funds can be recovered even if the device has been lost, as hardware wallets allow backups. The most popular bitcoin hardware wallets are Ledger Nano S, TREZOR and KeepKey. Once the wallet has been chosen and set up, one can proceed to the actual buying of bitcoin. The most straightforward way for first-time bitcoin buyers is to purchase the cryptocurrency with a credit card. For this, it’s simply necessary to register on a cryptocurrency exchange and link your bank account or credit card. Choosing the right exchange platform among the wide range of exchanges worldwide might not seem at all easy. Coinbase is one of the best-known and user-friendly cryptocurrency exchanges that serves over 20 million users in 32 countries and allows to start buying and selling cryptocurrency in only a few minutes. 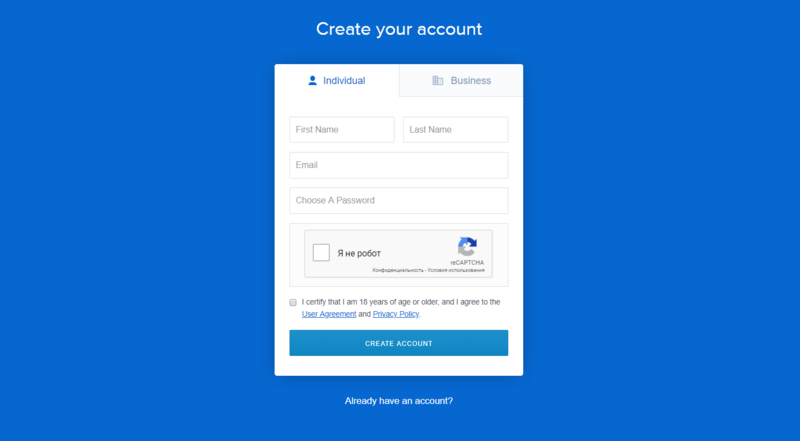 At first, it’s necessary to sign up to a Coinbase account here by providing details as your name, address and phone number then verify your identity with a passport or ID card. Next, users need to add a wallet or fiat payment methods, for example, a bank account or credit card. Once an account has been set up, it has to be linked to cash. Linking a banking account is more profitable, as credit card transfers have higher fees. Finally, to buy bitcoin, it’s necessary to sign in and choose the Buy/Sell tab. After selecting the currency to-be bought, users need to indicate the Payment Method and enter the amount that will be purchased. After these steps have been completed, it’s simply necessary to click on “Buy Bitcoin.” Coinbase will charge the transaction fee and send the remaining bitcoin to the account wallet. Fees vary across continents and countries and depend on the payment method. Bitcoin can also be bought with other cryptocurrencies. If users have stored altcoins, these can be easily turned into bitcoin on a wide range of exchanges. This will even cost cheaper, as using a bank account generally includes an additional 1.49% to 5% fee for each transaction. Meanwhile exchanging crypto for crypto will cost 0% to 0.4% instead. Among pure crypto exchanges, Binance has the lowest fees. It takes no fees for deposits and charges a 0.1% trading fee. Another easy way to exchange crypto for crypto is through Changelly - an instant cryptocurrency exchange service, where it’s actually not necessary to deposit funds. The buying process is the same for all coins available on Changelly. It’s necessary to go to Changelly.com and choose the coin to be exchanged on the left and the coin to be bought on the right, specify the amount and then click the “Exchange!” button. Users will then need to specify the wallet address, where the funds will be sent to. The transaction usually gets completed within 5-30 minutes. There is no easy way to buy bitcoin with PayPal, but it can be done through VirWoX. This platform actually serves as a market for Second Life Lindens, a currency used in the digital world. It is impossible to buy bitcoins with PayPal directly; therefore, it’s first necessary to buy Second Life Lindens (SLL) and then use them to buy bitcoin. After setting up an account, one will need to deposit dollars or euros using PayPal to VirWoX, purchase SLL with USD or EUR and then exchange SLL for bitcoin. While the process could seem too complex and lengthy, VirWoX is actually the fastest and best way to buy bitcoin via PayPal. However, the crazy high fee of 10% is a major shortcoming. While bitcoin is widely accepted as a means of payment by a number of sellers worldwide, PayPal deems it as highly volatile and bans its users from selling bitcoin for PayPal funds. Buying bitcoin via ATMs could be the fastest way to purchase the cryptocurrency. However, bitcoin ATMs are not available in a lot of regions, the Coin ATM Radar will help figure out the closest ATM in one’s area. The website collects all information about bitcoin ATMs, including fees, verifications, online status, etc. A notable aspect of these ATMs is that it allows to buy/sell bitcoin anonymously. While the process may vary depending on the machine type, it is generally necessary to choose “Buy Bitcoin,” indicate the amount, provide bitcoin address to deposit, scan the QR code, insert cash and confirm the transaction. Another way of acquiring bitcoin is to sell something. To sell stuff for crypto, one will need to post an advertisement on a website describing the item. Below are some bitcoin marketplaces. Glyde - a marketplace for buying and selling smartphones, tablets, MacBooks, video games, and iPods, where sellers can choose to have their earnings withdrawn in bitcoin. Bitify - a platform that allows to list items for free and earn bitcoin. It charges a 2.5% fee on sold items. BitMarket - a subreddit where users can post both items for sale and items they’d like to buy. Many employers are ready to pay for services with bitcoin. Coinality is one of the platforms, which helps connect employers and job seekers with opportunities that pay in digital currencies. Jobs range from one-time to full-time, and negotiations are handled independently between the two parties. Jobs4Bitcoins is a subreddit, where employers offer anyone to exchange talents and skills for bitcoin. On XBTFreelancer employers hire freelancers and pay for projects in bitcoin. Once bitcoin has been acquired, earned or exchanged, it’s time to think about where it can be used. Cryptocurrencies are becoming an increasingly popular instrument of payment, as many companies are beginning to see digital currencies as a valid form of payment for the wares they sell. There are more than 100,000 sellers globally ready to provide goods and services in exchange for cryptocurrency. A handful of universities across the world are currently accepting bitcoin for payments. These include, but are not limited to the Lucerne University of Applied Sciences and Arts in Switzerland, FPT University in Vietnam, The King’s College in New York, the University of Nicosia in Cyprus, the University of Cumbria in the UK, and the European School of Management and Technology in Berlin. Cryptocurrency payments appear to be finding a niche within the real estate industry. There are a number of documented examples of people wishing to trade a property in exchange for digital currency. A number of companies are even accepting donations in cryptocurrency. Donating money in bitcoin is a perfect way to avoid any fees and keep the donation anonymous. A wide range of goods and services that can be bought for bitcoin is available here.